12 MORE Easy Image Transfer Techniques! A few years ago I wrote a post called 12 Easy Image Transfer Methods, where I put together a collection of some of my favorite transfer techniques from this blog, and around the web. Since that time, we’ve tried out many new Easy Image Transfer Techniques on this blog, so I thought was time to put together a new collection with these new Techniques! I’m also adding in some posts that provide tips that will make things easier for you when working with Transfers. I hope you find this resource useful for your Furniture, DIY, and Craft Projects! Make sure you read the instructions carefully on each Tutorial, as they are usually pretty specific! 1) How to Transfer an Image onto Furniture : This is the Video version of the original Furniture Transfer Tutorial that I created several years ago. My friend Candice is great on Video and she kindly put this Tutorial together! The Video will show you how to blow up your image really big, using a free program, and an easy cheap transfer method, so that you can paint your image on large or small pieces of Furniture, Walls or Signs. Great for painted wood pieces or natural wood. Works best with simple designs like many of the French Typography Printables that I offer here on my blog. 2) : Transfer Method for Inkjet or Laser Prints: This is a very versatile Transfer Product! Often the products, or techniques, used for transferring involve a particular type of print from a particular machine. Not so with this method! You can use your home Inkjet printer, home Laser Printer or a Zerox machine from your favorite copy shop! We’ve got all 3 types compared so that you can see the results for yourself! Works with Wood or Fabric. 3) DIY Packing Tape Transfers: This is a super fast and fun Technique! This works great with Glass, and although, we haven’t tried it, some of readers have mentioned that it’s good for shiny Ceramic pieces too! The effect is similar to a decal, so best used on Decorative pieces only, like Votives and Vases etc. 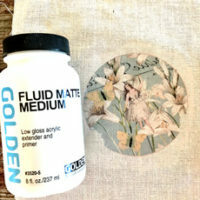 4) Transfer to Leather: On this post Candie Cooper, shows us how to transfer onto Leather, using a unique product that was created with Jewelry Artists in mind! Step by Step instructions for making a Leather Butterfly Necklace, are also provided. 5) Mod Podge Transfer Medium: In this Tutorial I test out a new product by Mod Podge made specifically for image or Photo Transfers. There’s also a Printable and a fun DIY Project for making your own customized Furniture Knobs! This Medium works great for Small Wood Projects or Light or Dark Fabric Projects. 6) 6 Ways to Print on Fabric: Printing directly onto fabric, with your home printer, is easy and so much fun! For those of you that sew (or don’t mind gluing your projects) you will find this info super handy! There are also, some bonus tips in addition to the Tutorials. 8) Wood Transfer Method: This is a cool video by The Crafsman, showing a great new technique that works on Raw, Stained or Painted Wood. According to the Crafsman it works on Metal too! 9) Clear Contact Method: Learn how to use Clear Contact Paper to transfer Color Images onto Glass! Similar to the Packing Tape method, only you can do larger pieces since the Contact Paper is so much bigger! Easy and fun! 10) High Quality Image Transfers on Fabric: In this post Heather, shows us how to get a very high quality transfer onto fabric, using an exciting new technique! This technique works best with fabric and bonus… she tested it out and it’s washable! 11) Easy Clay Image Transfer: You’ll find this one over on my pal Johnnie’s blog! She’ll walk you through the steps of Image and Photo Transfers onto Polymer Clay so that you can make the cutest Vintage Image Jewelry ever! 12) Transfer a Simple Image onto Glass: This is a low tech method, that Andrea came up with, for transferring onto Glass. It’s so easy that you can do this one with kids! Depending on the materials that you use, you can make the transfer permanent or not. Fun! 13) DIY Screen Printing with Mod Podge: This is a super fun technique by my friend Amy, at Mod Podge Rocks! This technique works best with chunkier designs, like Silhouette images, as you will only be working with the outline of the design. This method is another one that’s good for Fabric projects. 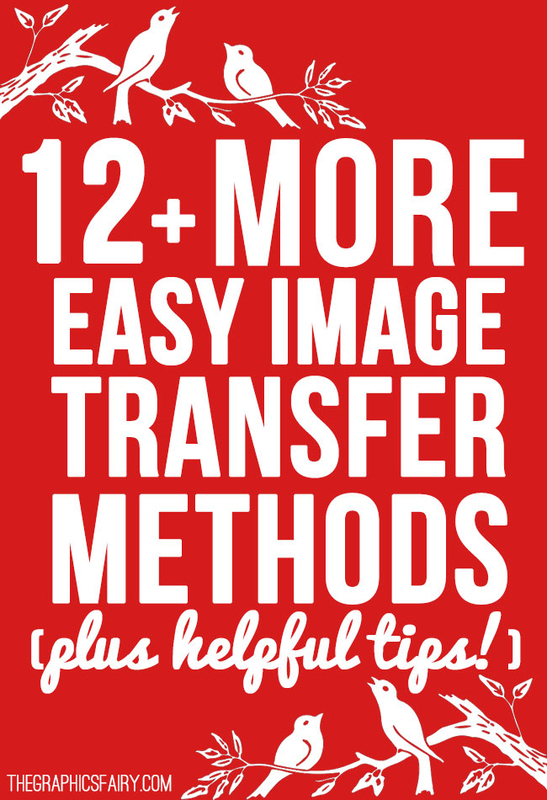 14) 12 Image Transfer Methods – Original Post: If you haven’t checked out my original post on this subject, make sure you check it out for even more methods! 1) How to Mirror Your Images for Transfers: Depending on your chosen transfer method, you may need to reverse or mirror your image. This post shows you an easy way to achieve that using the Paint program! 2) How to Reverse Your Images with Picmonkey: It’s no secret that we love Picmonkey! If you do too, you can use follow these instructions, by Emily, to reverse or mirror your images. 3) My Top Tip for working with Transfers: Last, but certainly not least, is my best tip for working with transfers. Make sure you read this one, before you start any of the projects above, to make it easier on yourself! Well hopefully that will clear things up and be helpful to you. Feel free to grab my Transfer Printables to use in your projects. Have fun with these Easy Image Transfer Techniques! Be sure and also check out our Premium Membership site HERE, for loads of PNG images, with transparent backgrounds, these types of images are great for Transfer Projects, Crafts, Scrapbooking, Graphics Design and more! Image Transfer Medium Testing – Replacements for 1Gel! 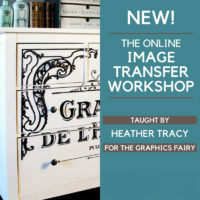 DIY Clear French Labels Project + free printable The Online Image Transfer Workshop is Open Now! « Marvelous Vintage Lions Image! Hi CC, Often times a Photocopy will work and that is what I do in that situation. The exception to that is the Citra Solv method, a Photocopy will work for that method too, but only some types of photocopies. The machine must be very old and use toner based ink, in order to work with Citra Solv, it’s getting harder and harder to find those machines! For the rest of the methods a photocopy should be just fine! Just remember to follow the very last tip on this page though, to save yourself some headaches! Can I ask a question about the Citra solve, I have been practising with it, but I’d really like a clear step by step guide as my images don’t seem to come out great, I generally want to use on painted furniture but also on bare wood, thanks! Hi Bev, There’s a link on this post for my original 12 transfer methods post, just click on that and you’ll find the steps for the Citra Solve Method. I hope that helps! I’m looking for the best method of transfering images to leather. Something that will give me clean sharp images. Any suggestions? Do you transfer 8 track tapes to discs? If not can you recommend someone who does? No we do not I think I heard that Costco does things like that. Good luck!